Alexander fighting Persian king Darius III. From Alexander Mosaic of Pompeii, Naples, Naples National Archaeological Museum. The wars of Alexander the Great were fought by King Alexander III of Macedon ("The Great"), first against the Achaemenid Persian Empire under Darius III, and then against local chieftains and warlords as far east as Punjab, India. 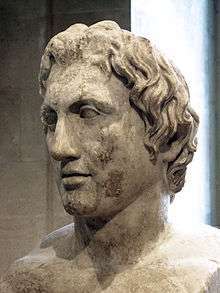 Alexander the Great was one of the most successful military commanders of all time. He was undefeated in battle. By the time of his death, he had conquered most of the world known to the ancient Greeks. Although being successful as a military commander, he failed to provide any stable alternative to the Achaemenid Empire—his untimely death threw the vast territories he conquered into civil war. Alexander assumed the kingship of Macedon following the death of his father Philip II, who had unified most of the city-states of mainland Greece under Macedonian hegemony in a federation called the League of Corinth. After reconfirming Macedonian rule by quashing a rebellion of southern Greek city-states and staging a short but bloody excursion against Macedon's northern neighbors, Alexander set out east against the Achaemenid Persian Empire, under its "King of Kings" (the title all Achaemenid kings went by), Darius III, which he defeated and overthrew. His conquests included Anatolia, Syria, Phoenicia, Judea, Gaza, Egypt, Bactria, and Mesopotamia, and he extended the boundaries of his own empire as far as Punjab, India. News of Philip's death roused many states into revolt including Thebes, Athens, Thessaly, and the Thracian tribes to the north of Macedon. When news of the revolt reached Alexander he responded quickly. Though his advisers advised him to use diplomacy, Alexander mustered the Macedonian cavalry of 3,000 men and rode south towards Thessaly, Macedon's immediate neighbor to the south. When he found the Thessalian army occupying the pass between Mount Olympus and Mount Ossa, he had the men ride through Mount Ossa and, when the Thessalians awoke, they found Alexander at their rear. The Thessalians surrendered and added their cavalry to Alexander's force as he rode down towards the Peloponnese. Before crossing to Asia, Alexander wanted to safeguard his northern borders and, in the spring of 335 BC, he advanced into Thrace to deal with the revolt, which was led by the Illyrians and Triballi. At Mount Haemus, the Macedonian army attacked and defeated a Thracian garrison manning the heights. The Macedonians were then attacked in the rear by the Triballi, who were crushed in turn. Alexander then advanced on to the Danube, encountering the Getae tribe on the opposite shore. The Getae army retreated after the first cavalry skirmish, leaving their town to the Macedonian army. News then reached Alexander that Cleitus, King of Illyria, and King Glaukias of the Taulanti were in open revolt against Macedonian authority. Alexander defeated each in turn, forcing Cleitus and Glaukias to flee with their armies, leaving Alexander's northern frontier secure. In 334 BC, Alexander crossed the Hellespont into Asia. It took over one hundred triremes (boats with oars) to transport the entire Macedonian army, but the Persians decided to ignore the movement. In these early months, Darius still refused to take Alexander seriously or mount a serious challenge to Alexander's movements. Memnon of Rhodes, the Greek mercenary who aligned himself with the Persians, advocated a scorched earth strategy. He wanted the Persians to destroy the land in front of Alexander, which he hoped would force Alexander's army to starve, and then to turn back. Eventually, with Alexander advancing deeper into Persian territory, Darius put Memnon in control of an army, and told him to finally confront Alexander. Map of what would become Alexander's empire. Arrian, Diodorus, and Plutarch all mention the battle, with Arrian providing the most detail. The Persians placed their cavalry in front of their infantry, and drew up on the right (east) bank of the river. The Macedonian line was arrayed with the heavy Phalanxes in the middle, and cavalry on either side. The Persians expected the main assault to come from Alexander's position and moved units from their center to that flank. Alexander's second-in-command, Parmenion, suggested crossing the river upstream and attacking at dawn the next day, but Alexander attacked immediately. This tactic caught the Persians off guard. The battle started with a cavalry and light infantry attack from the Macedonian left, so the Persians heavily reinforced that side. However, by this point, Alexander led the horse companions in their classic wedge-shaped charge, and smashed into the center of the Persian line. Several high-ranking Persian nobles were killed by Alexander himself or his bodyguards, although Alexander was stunned by an axe-blow from a Persian nobleman named Spithridates. Before the noble could deal a death-blow, however, he was himself killed by Cleitus the Black. Alexander's horse was killed, although he was not at the time riding his beloved Bucephalus. The Macedonian cavalry opened a hole in the Persian line, and the Macedonian infantry charged through to engage the poor quality Persian infantry in the rear. At this, and with many of their leaders already dead, both flanks of the Persian cavalry retreated, and the infantry was cut down as it fled. After the battle, Alexander buried the dead (Greeks and Persians), and sent the captured Greek mercenaries back to Greece to work in the mines, as an object lesson for any Greek who decided to fight for the Persians. He sent some of the spoils back to Greece, including three hundred panoplies (complete Persian suits of armor) back to Athens to be dedicated in the Parthenon with the inscription “Alexander, son of Philip and the Greeks, Lacedaemonians (Spartans) excepted, these spoils from the barbarians who dwell in Asia”. 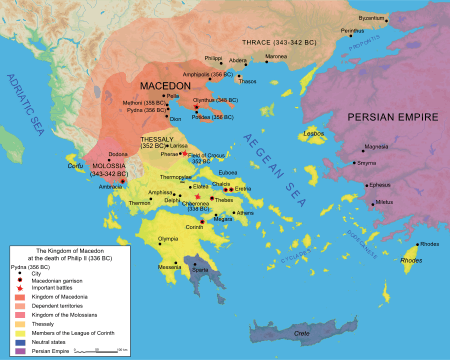 The Siege of Halicarnassus was undertaken in 334 BC. Alexander, who had no navy, was constantly being threatened by the Persian navy. It continuously attempted to provoke an engagement with Alexander, who would have none of it. Eventually, the Persian fleet sailed to Halicarnassus, in order to establish a new defense. Ada of Caria, the former queen of Halicarnassus, had been driven from her throne by her usurping brother. When he died, Darius had appointed Orontobates satrap of Caria, which included Halicarnassus in its jurisdiction. On the approach of Alexander in 334 BC, Ada, who was in possession of the fortress of Alinda, surrendered the fortress to him. Alexander and Ada appear to have formed an emotional connection. He called her "mother", finding her more amicable than his megalomaniacal snake-worshiping mother Olympias. In return for his support, Ada gave Alexander gifts, and even sent him some of the best cooks in Asia Minor, realizing that Alexander had a sweet tooth. In the past, Alexander had referred to his biological father, Philip, as his "so-called" father, and preferred to think of the deity Amon Zeus as his actual father. Thus, he had finally managed to divorce himself from both of his biological parents. Shortly after the battle, Memnon died. His replacement was an Athenian named Karademas. Darius's generals wanted Darius to personally command the army during a major battle against Alexander. Karademas, who thought that this would be too reckless, got into an argument with Darius's generals. He implied that he should lead the army because, as a Greek, he was a better general than any of the Persians. An argument resulted, Karademas made some uncomplimentary comments about Persian culture, and Darius ordered Karademas executed. Shortly thereafter, Darius realized that he had made a mistake, because he had just executed the only competent general he had left. He decided to take his army, and leave Babylon in order to intercept Alexander. Alexander marched his army east through Cappadocia, where, for a stretch of nearly 150 km (93 mi), there was no water. As his army approached Mount Taurus, they found only one route through which to pass, which was a narrow defile called "The Gates". The defile was very narrow, and could have been easily defended. However, the Persian satrap of Cappadocia had an inflated view of his own abilities. He had been at the Battle of the Granicus River, and had believed that Memnon's scorched Earth strategy would work here. He didn't realize that the different circumstances of the terrain made that strategy useless. Had he mounted a credible defense of the defile, Alexander would have been easily repulsed. He left only a small contingent to guard the defile, and took his entire army to destroy the plain that lay ahead of Alexander's army. The Persian contingent that was supposed to guard the defile soon abandoned it, and Alexander passed through without any problems. Alexander supposedly said after this incident that he had never been so lucky in his entire career. Initially, Alexander chose what was apparently unfavorable ground. This surprised Darius who mistakenly elected to hold the wrong position while Alexander instructed his infantry to take up a defensive posture. Alexander personally led the more elite Greek Companion cavalry against the Persian left up against the hills, and cut up the enemy on the less encumbering terrain and thereby generating a quick rout. After achieving a breakthrough, Alexander demonstrated he could do the difficult and held the cavalry successfully in check after it broke the Persian right. Alexander then mounted his beloved horse Bucephalus, took his place at the head of his Companion cavalry, and led a direct assault against Darius. The horses that were pulling Darius' chariot were injured, and began tossing at the yoke. Darius, about to fall off his chariot, instead jumped off. He threw his royal diadem away, mounted a horse, and fled the scene. The Persian troops, realizing they had lost, either surrendered or fled with their hapless king. The Macedonian cavalry pursued the fleeing Persians for as long as there was light. As with most ancient battles, significant carnage occurred after the battle as pursuing Macedonians slaughtered their crowded, disorganized foe. After Alexander defeated the last of the Achaemenid Empire's forces 328 BC, he began a new campaign against the various Indian kings in 327 BC. He wanted to conquer the entire known world, which in Alexander's day, ended on the eastern end of India. Greeks of Alexander's day knew nothing of China, or any other lands east of India. The Siege of the Sogdian Rock, a fortress located north of Bactria in Sogdiana, occurred in 327 BC. Oxyartes of Bactria had sent his wife and daughters, one of whom was Roxana, to take refuge in the fortress, as it was thought to be impregnable, and was provisioned for a long siege. When Alexander asked the defenders to surrender, they refused, telling him that he would need "men with wings" to capture it. Alexander asked for volunteers, whom he would reward if they could climb the cliffs under the fortress. There were some 300 men who from previous sieges had gained experience in rock-climbing. Using tent-pegs and strong flaxen lines, they climbed the cliff face at night, losing about 30 of their number during the ascent. In accordance with Alexander's orders, they signaled their success to the troops below by waving bits of linen, and Alexander sent a herald to shout the news to the enemy's advanced posts that they might now surrender without further delay. The defenders were so surprised and demoralized by this that they surrendered. Alexander fell in love with Roxana, whom ancient historians call the "most beautiful woman in the world" (not an uncommon claim for an ancient queen) on sight and eventually married her. 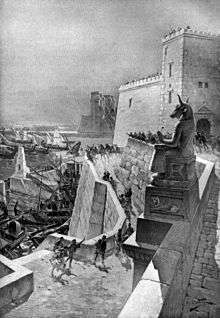 The story of the siege is told by the Roman historian Arrian of Nicomedia, in Anabasis (section 4.18.4-19.6). 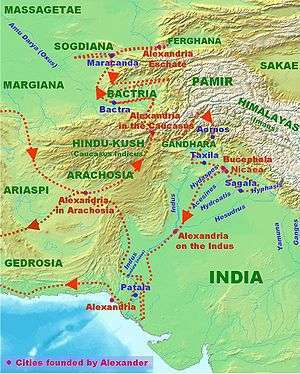 Campaigns and landmarks of Alexander's invasion of the Indian subcontinent. After the death of Spitamenes and his marriage to Roxana (Roshanak in Bactrian) to cement his relations with his new Central Asian satrapies, Alexander was finally free to turn his attention to the Indian subcontinent. Alexander invited all the chieftains of the former satrapy of Gandhara, in the north of what is now Pakistan, to come to him and submit to his authority. Omphis, ruler of Taxila, whose kingdom extended from the Indus to the Hydaspes, complied, but the chieftains of some hill clans, including the Aspasioi and Assakenoi sections of the Kambojas (known in Indian texts also as Ashvayanas and Ashvakayanas), refused to submit. After reducing Aornos, Alexander crossed the Indus and fought and won an epic battle against a local ruler Porus, who ruled a region in the Punjab, in the Battle of Hydaspes in 326 BC. After the battle, Alexander was greatly impressed by Porus for his bravery in battle, and therefore made an alliance with him and appointed him as satrap of his own kingdom, even adding some land he did not own before. 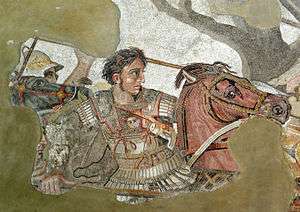 Alexander then named one of the two new cities that he founded, Bucephala, in honor of the horse who had brought him to India, who had died during the Battle of Hydaspes. East of Porus' kingdom, near the Ganges River, was the powerful Nanda Empire of Magadha and Gangaridai Empire of Bengal. Fearing the prospects of facing other powerful Indian armies and exhausted by years of campaigning, his army mutinied at the Hyphasis River, refusing to march further east. This river thus marks the easternmost extent of Alexander's conquests. Asia in 323 BC, the Nanda Empire and Gangaridai Empire of Ancient India in relation to Alexander's Empire and neighbors. Alexander spoke to his army and tried to persuade them to march further into India but Coenus pleaded with him to change his opinion and return, the men, he said, "longed to again see their parents, their wives and children, their homeland". Alexander, seeing the unwillingness of his men agreed and turned south. Along the way his army conquered the Malli clans (in modern day Multan), reputed to be among the bravest and most warlike peoples in South Asia. Following this, the surviving Malli surrendered to Alexander's forces, and his beleaguered army moved on, conquering more Indian tribes along the way. In the territory of the Indus, he nominated his officer Peithon as a satrap, a position he would hold for the next ten years until 316 BC, and in the Punjab he left Eudemus in charge of the army, at the side of the satrap Porus and Taxiles. Eudemus became ruler of a part of the Punjab after their death. Both rulers returned to the West in 316 BC with their armies. In 321 BC, Chandragupta Maurya founded the Maurya Empire in India and overthrew the Greek satraps. ↑ See, e.g., ac.wwu.edu Archived 13 October 2008 at the Wayback Machine. ↑ Freeman, Charles. The Greek Achievement: The Foundation of the Western World. Allen Lane, 1999. ISBN 9780713992243. p.172: "In scope and extent his achievements ranked far above that of the Macedonian king, Alexander ("the Great") who was to demolish the empire in the 320s but fail to provide any stable alternative." ↑ Sacks, David, (1995), Encyclopedia of the Ancient Greek World, London: Constable and Co. Ltd, ISBN 0-09-475270-2, p. 16. ↑ McCarty, Alexander the elmo, p. 30-31. ↑ McCarty, Alexander the Great, p. 31. ↑ Bose, Alexander the Great's Art of Strategy, p. 96. Arrian, The Campaigns of Alexander, p. 44–48. Arrian, The Campaigns of Alexander, p. 50–54. ↑ Plutarch. Phocion. p. 17. ↑ Stafford, Ned (14 May 2007). "How geology came to help Alexander the Great". Nature.com. Retrieved 17 May 2007. 1 2 "Siege of Tyre and Gaza". Retrieved 19 January 2007. ↑ "Leaders and Battles: Gaza, Siege of". Leaders and Battles Database. Archived from the original on 22 October 2006. Retrieved 18 January 2007. ↑ Robinson, Cyril Edward (1929). A History of Greece. Methuen & Company Limited/Google books. Retrieved April 1, 2013. ↑ Farrokh, Kaveh (April 24, 2007). Shadows in the Desert: Ancient Persia at War (General Military). Osprey Publishing/Google Books. p. 106. ISBN 1846031087. Retrieved April 1, 2013. ISBN 978-1846031083. ↑ N. G. L. Hammond (1992). "The Archaeological and Literary Evidence for the Burning of the Persepolis Palace", The Classical Quarterly 42 (2), p. 358-364. ↑ Narain, A. K. (1965). Alexander the Great: Greece and Rome – 12. pp. 155–165. ↑ Curtius in McCrindle, Op cit, p 192, J. W. McCrindle; History of Punjab, Vol I, 1997, p 229, Punajbi University, Patiala, (Editors): Fauja Singh, L. M. Joshi; Kambojas Through the Ages, 2005, p 134, Kirpal Singh. ↑ Arrian (2004). Tania Gergel, ed. The Brief Life and Towering Exploits of History's Greatest Conqueror as Told By His Original Biographers. Penguin Books. p. 120. ISBN 0-14-200140-6. ↑ Plutarch, "Alexander". p. 62. ↑ Plutarch, The Life of Alexander, 66. Farrokh, Kaveh (April 24, 2007). Shadows in the Desert: Ancient Persia at War (General Military). Osprey Publishing/Google Books. p. 106. ISBN 1846031087. Retrieved April 1, 2013. ISBN 978-1846031083. Robinson, Cyril Edward (1929). A History of Greece. Methuen & Company Limited/Google books. Retrieved April 1, 2013.